Beating out two agencies, I redesigned University of Maryland University College's student portal experience. UMUC is a primarily online university. 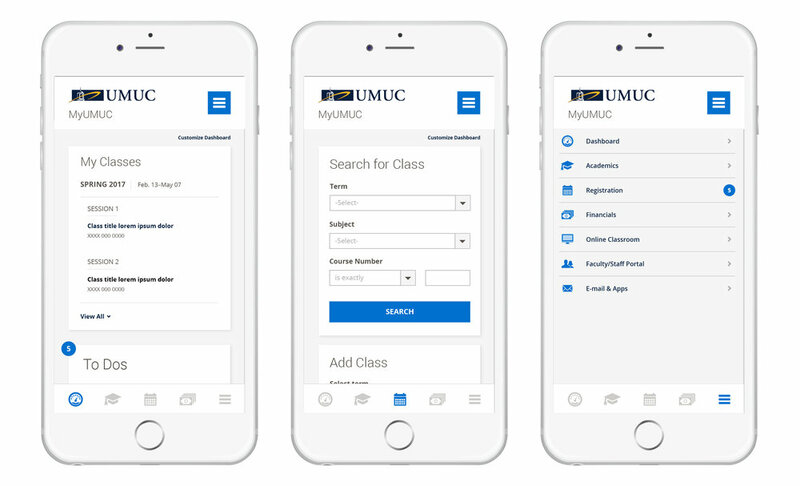 Their students primarily study online and are web savvy; used to best-in-class digital experiences from companies like Apple and Amazon and expect UMUC to deliver an equivalent user experience as an online university. Their goal is for the MyUMUC portal to become the student's chosen charting point for UMUC interactions instead of bookmarking into various components separately, as they currently do. Create a modern, intuitive, and user-centered responsive landing page design for the student portal. The design should provide an at-a-glance dashboard of the most frequently accessed and important modules in the student account. The portal must be highly intuitive and usable, aesthetically pleasing and modern in design, with inspiration taken from industry leading user experiences.